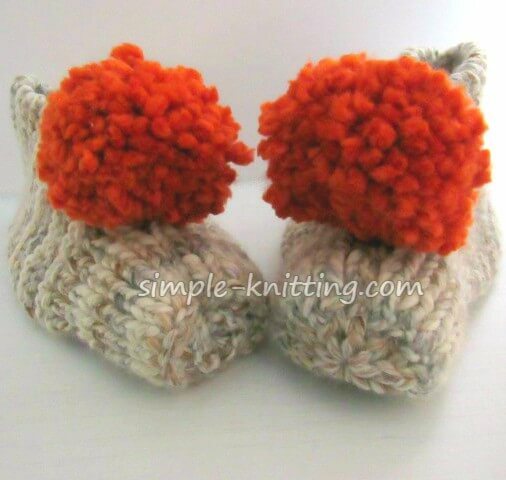 This easy to knit slippers pattern is a fun knitting project for everyone, even beginners. Everyone loves slippers! This cozy slipper pattern has been around for decades and the nice thing is they're fast, simple and knit flat. 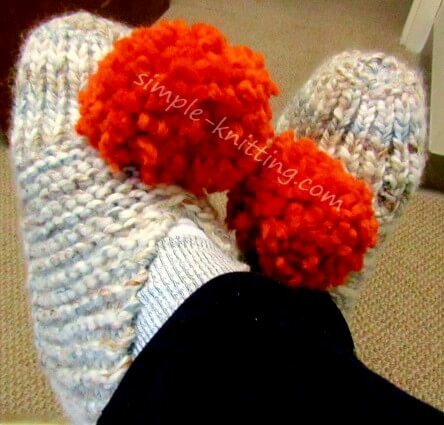 So if you're a beginner knitter I'm sure you'll be able to tackle these cozy slippers too. I'm sure you'll notice pattern variations as you search for the perfect pair of knitted slippers to make. This is the version I like to use. The nice thing is there's no need to buy slippers when you can whip these up in no time. 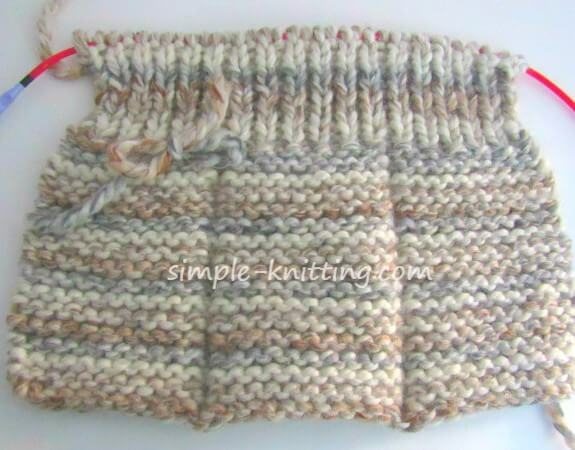 All you need to know is how to knit and purl and use the K2tog decrease which means knit 2 stitches together as one. You can knit these two at a time if you're comfortable enough knitting. Slipper knitting is a lot like sock knitting which means they're a nice portable knitting project. 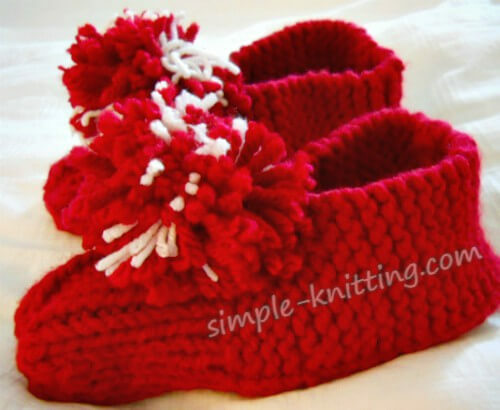 These knitted slippers make wonderful gifts. In fact it's one of my favorite gifts to knit. There are many different yarns you can use for knitting slippers. In fact years and years ago I think everyone used worsted weight yarn and held two strands together as one for thickness. The nice thing with this way is you can buy two different color yarns for a colorful pair of knitted slippers. The Cascade yarn is 100% washable wool while the others are part wool and part acrylic and machine washable too. What are some of your favorite worsted weight yarns? Give them a try too! Just remember to buy enough because you'll be using 2 strands as one. If you'd like try a thicker yarn and avoid holding two strands together I really like Lion Brand Wool Ease Thick & Quick. 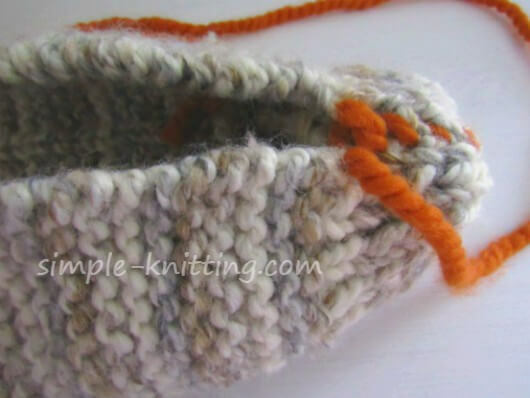 It's a great thickness to use for these knit slippers. Of course you can try other (6-Super Bulky) yarns too. Have fun with it. The knit slippers above are knit with Lion Brand Wool Ease Thick & Quick. It's important to keep in mind that whatever yarn you use for knitting slippers you'll want to make sure that the needle size is at least two to three sizes smaller than the suggested size on the yarn label. Why? Because if you use a really thick yarn and really fat needles the stitches will be very loose which will create holes in your slippers a lot faster. 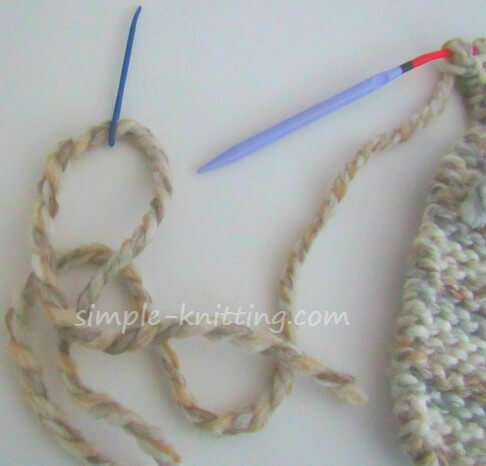 If you knit slippers on a smaller needle the stitches will be tighter and will help your slippers last longer. Yarn: There are many variations for yarn and you'll need about 200 - 300 yards. 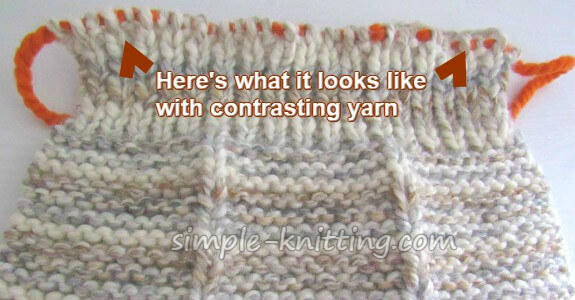 So for worsted weight yarn you'll need to hold 2 strands together as one. Sizes: Small - child, medium - women, large – men and extra large for wider feet. Pattern is written in small size with other sizes are in parenthesis. Cast on 27 (29, 35, 41) sts with your preferred cast on. I used the long tail. 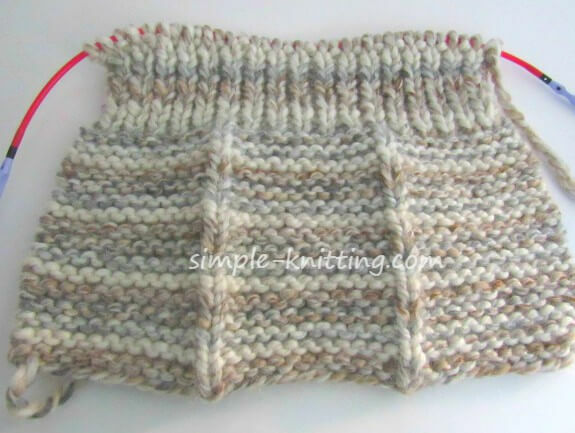 Repeat rows 1 and 2 until you have 13 (15, 17, 19) garter ridges on the right side of your work or until your desired length. If you need more or less rows by all means work the slipper according to your size. It's very easily adjusted. Please note: Keep in mind that you're knitting the length of your slipper so you will want the length to be approximately 2 (2.5, 2.5, 2.5) inches less than your actual foot size. This gives you 2 - 2.5 inches to knit the toe portion of your slipper. End on a 2nd row. K2tog across row. If you have an extra stitch simply knit it. You should have 7 (8, 9, 11) sts remaining. Break yarn leaving about 12 inches of yarn. When you're finished with your knitted slipper, this is what it will look like. This is the right side. There's three sections and the middle one is the bottom of your slipper and then the two sides. This is the wrong side with the little indents going along the sides. Pay no attention to the extra yarn there, I had to add a new ball of yarn. 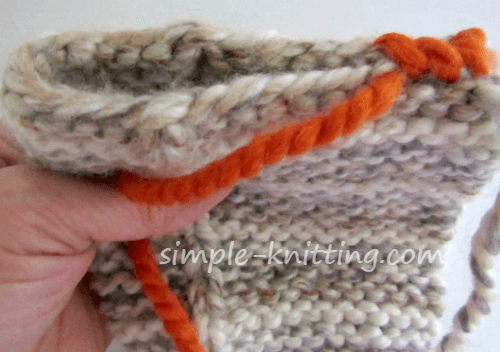 Thread yarn tail through tapestry needle and carefully push through the remaining stitches on your needle. What I like to do is put the tapestry needle in my right hand and slip each stitch as if to purl, off the knitting needle and onto the tapestry needle and yarn tail. Please note that you'll have much less stitches than in the picture. This is simply an example to show you. When you've got all the stitches, pull as tightly as you can being careful not to break yarn. You'll want to seam up the toe portion enough so that the slipper doesn't keep sliding off so it's your decision how far to go. Usually a half to one inch beyond ribbing works. Then go to the heel and seam the bottom of your slipper and you're done. 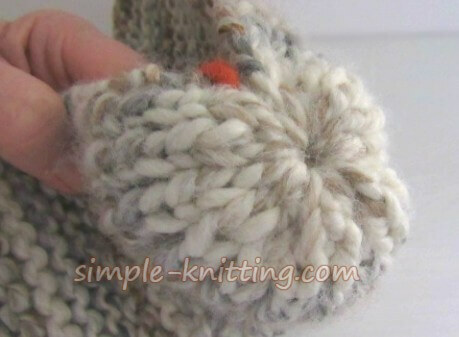 Weave in ends and add buttons or pom poms or just leave them plain, it's up to you. I hope you enjoy your knit slippers as much as I'm enjoying mine.